Granite countertops have been proven to add beauty to your home. These beautifully unique countertops can come in a variety of colors and designs. This natural stone is carefully cut to show the character of each piece, allowing you to select the granite countertops that will allow you to show your style. Granite countertops have long been said to be the best option for countertops in your home, with a focus on the kitchen. The experts at Granite Huggers in Sanger, Texas agree that granite countertops provide many benefits for your home. The igneous rock and holocrystalline structure that granite countertops are comprised of are part of what gives these beautiful counters their strength and durability. The crystals that the stone is made of don’t fully develop, but instead they grow together, reinforcing their strength. This also accounts for the unique beauty of each piece of granite that you choose to have installed in your kitchen or bathroom. These extremely durable surfaces can stand up to heat incredibly well and are resilient against scratches, making them ideal in kitchen settings. In fact, many people choose to do their food prep work directly on their granite countertops. While your countertops will endure this very well, you may want to still consider using a cutting board to prevent your knives from dulling. Granite countertops are also more sanitary than other countertop options. After they are sealed they are non-porous and cannot easily be contaminated by bacteria. They’re also easy to clean with a mild soap and warm water. Granite is also very stain resistant when properly sealed and can easily protect against grease and oil. Granite countertops come in a large variety of colors based upon the color of the crystal that runs throughout the stone. Popular colors for granite countertops include browns, black, gray, and white. The granite used in granite countertops is made of a number of crystals that produce these amazing colors and patterns throughout the rock. Quartz is one of the most common crystals found in granite and gives your granite countertops beautiful character. The quartz fills gaps between other materials in the granite. Though typically colorless, quartz can reflect the colors of the surrounding crystals. It also contributes greatly to the durability of your granite countertops. Mica is another crystal commonly found in granite. Mica adds metallic like flecks of silver, brown, violet, pink, and black. This crystal, in addition to its beauty, helps the granite appear polished. Feldspar is also a very common part of granite. The feldspar is what gives the granite most of its color. While granite comes in general “colors” for identification, it’s important to understand that no two countertops of granite are going to be exactly the same. While they can appear to be similar, the uniquely formed crystals that you see in various granite countertops are unique. This can bring individuality to your kitchen or bathroom, especially when you accent the beautiful tones throughout the granite countertops with other features in your kitchen or bathroom. Granite can also add additional design flare to your kitchen or bathroom due to the ability to cut the granite to custom shapes and sizes. 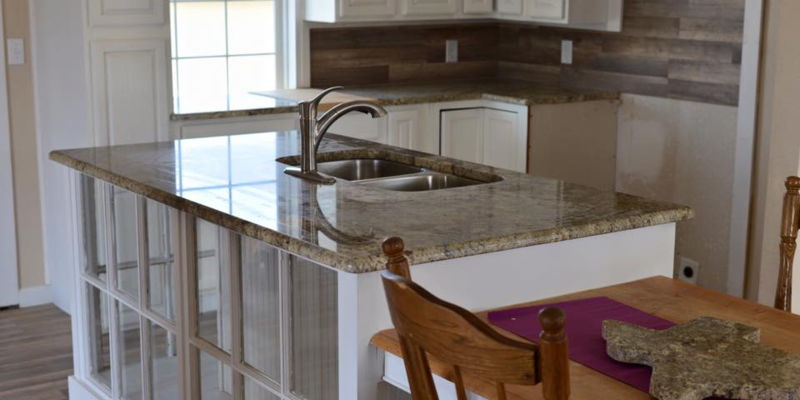 You also have the option of choosing from a variety of options for the edge of your granite countertops to provide more character to your home. The price of granite countertops can vary depending on the look that you are wanting for your home. However, some styles of granite countertops are more common and readily available, which makes them more affordable. Due to the durability of granite countertops, you can count on your investment to last longer than any other style of countertop. They need less maintenance than other types of counters and stand up to heat and scratches better as well. Granite countertops will also increase the value of your home. As more and more people come to respect how much value these granite countertops can add to your home with their long lasting beauty, they appreciate the value that they add. If you are planning on remodeling your kitchen prior to selling your home, consider installing granite countertops throughout the kitchen, or even just as an accent counter on the island. It brings additional character to the home that people love to see. Because granite countertops don’t depreciate in value, you know that you will always get your investment back when it comes time to sell your home. And if you have no intention of selling, you will get to enjoy their beauty and usefulness for decades to come. If you have any questions about granite countertops or would like a consultation, please call Granite Huggers in Sanger, Texas at (972) 670-4533.